Iatrogenic right-to-left shunting is a rare complication of repaired acyanotic congenital heart disease. This complication was seen in the era before cardiopulmonary bypass when the Eustachian valve was mistaken for the inferior rim of the atrial septum. It is rarely encountered in current surgical practice. We report a case of iatrogenic diversion of the inferior vena cava (IVC) to the left atrium (LA) after closure of a sinus venosus atrial septal defect (ASD) of the IVC type. A 10-year-old girl presented to our clinic with complaints of dyspnea on exertion and cyanosis of extremities after exertion. She had undergone surgical closure of IVC type of sinus venosus ASD 2 years ago. After surgery she had an episode of sudden onset stroke from which she recovered completely. The child was evaluated multiple times at the primary center and echocardiogram was done that apparently showed intact atrial septal patch with no other abnormality. On clinical examination, she was noted to have a central cyanosis with systemic saturation of 85%. Her heart rate was 84/ min and her blood pressure was 110/70 mm Hg. Clinically there was no auscultatory abnormality. Her electrocardiogram was normal. Her operative notes mentioned that after rerouting the right lower pulmonary vein to the LA, the fenestrations in the atrial septum were divided and enlarged to make a large defect that was then closed with a pericardial patch. Echocardiogram revealed a small fenestration in the ASD patch with left to right shunt. The superior vena cava (SVC) was seen draining normally into the right atrium (RA) and the pulmonary veins were seen draining to the LA. 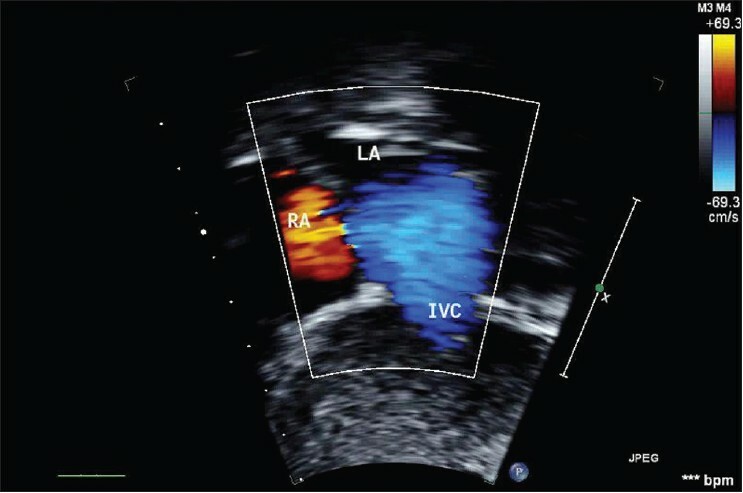 But the IVC flow could not be definitely documented draining to the RA [Figure 1]. A contrast (agitated 5% glucose saline) echocardiogram was performed from the venous access in the lower limb. 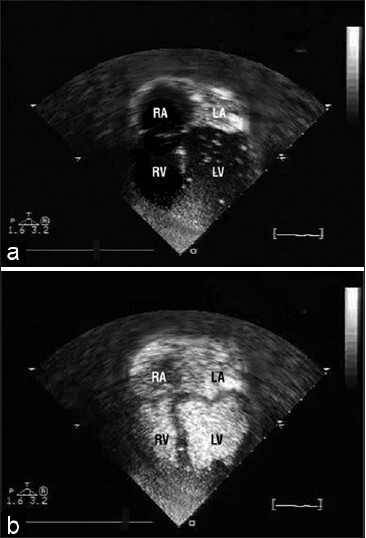 It showed appearance of the contrast first in the LA and subsequent filling of all four cardiac chambers suggestive of drainage of the IVC into the LA [Figure 2]a and b. Her serum hemoglobin was 15 gm% and her packed cell volume (PCV) was 52%. She was taken up for a diagnostic cardiac catheterization. An arterial blood gas sample taken though a radial artery showed a PaO2 of 105 mm Hg on FiO2 of 40%, suggestive of hypoxemia. A right femoral venous access was taken with a 6F sheath. A 6F Judkins right coronary (JR) 3.5 catheter was passed though the IVC and was seen directly entering the LA. The JR 3.5 was exchanged for a pigtail catheter that was placed in the IVC just below the diaphragm. 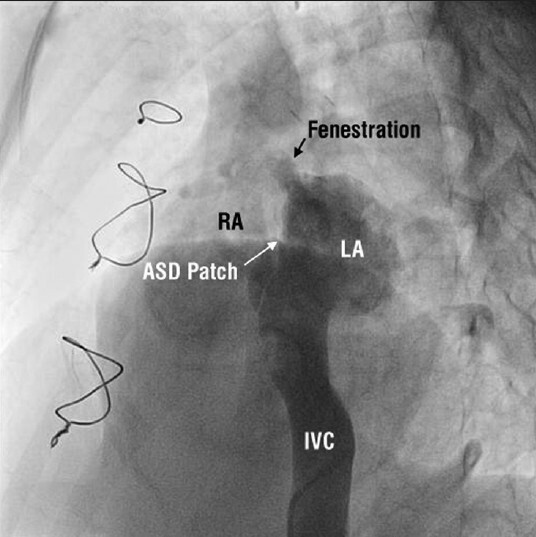 A contrast angiogram done in anteroposterior (AP) and left anterior oblique with cranial angulation (LAO Cr) showed the contrast entering the LA directly through the IVC and a small fenestration in the ASD patch through which the contrast filled the RA [Figure 3]. The SVC was entered after crossing the fenestration and entering the RA. Angiogram in the SVC showed its normal drainage into the RA with no spill over into the LA. The child was referred for surgery with the plan to redo the atrial patch directing the IVC to the RA. There also remains a risk of paradoxical embolism as in this case. The level of cyanosis may be reduced by factors such as partial diversion of the IVC to left atrium or stenosis of the IVC with decompressing collaterals draining to right atrium via the azygos and SVC. Transcatheter closure of the defects with device may be possible theoretically in cases where there is a residual defect in case of low lying secundum ASD with partial diversion of the IVC to the left atrium. The literature search though did not reveal any such reported case. In our case, the IVC was completely diverted to the left atrium with a small residual defect at the upper end of the patch. The only possible way of treating this defect by transcatheter means was to place a covered stent from the IVC into the LA and then into the right atrium via the fenestration. We decided against that in view of the young age of the child and uncertainty regarding placing a stent on the systemic side of the heart with a need for anticoagulation therapy. Early diagnosis of this condition can avoid complications related to cyanosis and hypoxia as well as other potentially life threatening complications like stroke due to paradoxical embolism. 1. Bedford DE, Sellors TH, Somerville W, Belcher JR, Besterman EM. Atrial septal defect and its surgical treatment. Lancet 1957;272:1255-61. 2. Bjork VO, Johansson L, Jonsson B, Norlander O, Nordenstrom B. The operation and management of a case after diversion of the inferior vena cava into the left atrium after the open repair of an atrial septal defect. Thorax 1958;13:261-6. 3. Mustard WT. Diversion of the venae cavae into the left atrium during closure of atrial septal defects. J Thorac Cardiovasc Surg 1964;47:317-24. 4. Shuntoh K, Wada Y, Kawai T, Oka T. Diversion of the inferior vena cava into the left atrium after repair of atrial septal defect with partial anomalous pulmonary venous drainage. Kyobu Geka 1997;50:740-2. 5. Ross JK, Johnson DC. Complications following closure of atrial septal defects of the inferior vena caval type. Thorax 1972;27:754-8. 6. Desnick SJ, Neal WA, Nicoloff DM, Moller JH. Residual right-to-left shunt following repair of atrial septal defect. Ann Thorac Surg 1976;21:291-5. 7. Staple TW, Ferguson TB, Parker BM. Diversion of the inferior vena cava into the left atrium following atrial septal defect closure. Am J Roentgenol Radium Ther Nucl Med 1966;98:851-8. 8. Alanbaei M, Jutras L, Therrien J, Marelli A. Iatrogenic cyanosis and clubbing: 25 years of chronic hypoxia after the repair of an atrial septal defect. Can J Cardiol 2007;23:901-3. 9. Fouty BW, Lynch DA, Fontenot AP, Schwarz MI. Hypoxemia explained 36 years later. Chest 2001;120:1739-40. 10. Munet M, Gayet C, Buttard P, Ninet J, Chapon P, Tremeau G, et al. Late discovery of inferior vena cava draining into the left atrium after surgical closure of atrial septal defect. Arch Mal Coeur Vaiss 1997;90:991-4.